MAN arrested in Hull as part of a major counter-terrorism investigation has appeared in court. Bakr Hamad, 38, is facing extradition to Italy where he has been accused of ‘international terrorism’. Hamad…appeared at Westminster Magistrates Court this afternoon along with three other men, Sharif Kadir, 52, of Sheffield, Zana Rahim, 32, of Derby and Awat Hamasalih, 33, of Birmingham. All four were arrested after a series of in simultaneous raids across Europe in which a total of 17 people were arrested. The North East Counter Terrorism Unit led the arrest operation in Hull supported by officers from Humberside Police. The operation was described as “the most important international police operation in Europe in 20 years”. The men have been linked to a Kurdish terrorist organisation Rawti Shax, which is linked to al-Qaeda and the Ansar al-Islam Islamic group. 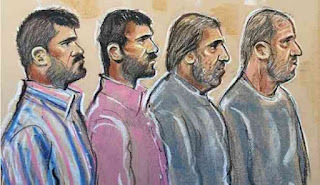 In court Hamad and his three co-accused refused to consent to extradition to Italy which is leading the investigation. Their lawyers indicated they may challenge the extradition request because they hold refugee status….